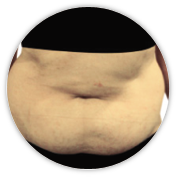 The tummy area is where fat accumulates most easily, and is also the first warning sign that one is putting on weight. The bulge of fat around the waist is especially prominent in tight tops or jeans. Some people may be at their ideal weight but because of neglect, they may also develop a bulging tummy. Lack of exercise, incorrect posture or frequent consumption of greasy, heavy-tasting food, can cause fat cells to accumulate on the tummy. Staying stationary after a meal or consuming a large meal in one sitting can also result in fat cells concentrating in one area, thus giving it a thick and bulging appearance. Regular constipation can occur if impurities and toxins stored within the intestines are not discharged regularly. A big bulging tummy totally ruins one's image; tighter and sexier clothing choices become out of reach. Generally, women in their 20s will start to show signs of a bulging tummy. Treating it when one's metabolism is high will ensure faster results. With age, however, the body's metabolic rate slows down and weakens, and by the time one reaches 40, stubborn fat would have accumulated, causing the appearance of a protruding tummy. By this time, treating it can only give you an 80% chance of restoring a slim figure.